G & J Heating and Cooling is a three generation strong heating and cooling, mechanical contractor located in Hudsonville, MI. We have been in business and serving all of the Western Michigan area for 40 plus years. We, at G & J Heating and Cooling, strive to give you a top-notch heating and cooling system at a competitive price. We are a Bryant dealer and have been since day one. Bryant has been a great line for us and we continue to sell, service and install them proudly. We have found that Bryant equipment offers superior quality, performance and years of trouble free operation. We also carry Payne equipment as our second line and have found them to be very reliable and also a great product. Bryant and Payne equipment also now have a 10-year all parts warranty for years of protection. G & J Heating and Cooling services everything we install in case you run into a problem a few years down the road. We also service all heating and cooling equipment quickly and for a very competitive price. ​Give us a call or email today; you will be very glad you did! We service all heating and cooling equipment quickly and for a very competitive price. "I have worked with many heating contractors in my field and I have found G & J Heating & Cooling the most honest and easiest to work with; that is why I chose them to work on my own house." 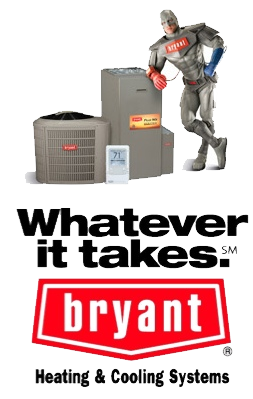 Your Bryant and Payne dealer for heating and cooling in the West Michigan, Grand Rapids area!